I finished Book Three in my Damaged Heroes Series! 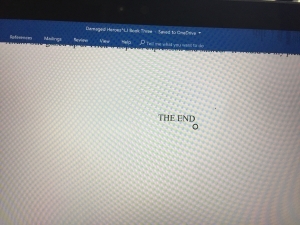 For some reason, this far into my career, A Savage Trick was the hardest first draft I’ve ever written, clocking in three times longer than my other novels. The manuscript is due to my editor next Monday, so bear with me as I scramble towards that deadline, then I’ll be back to give you some snippets and blurbs! Also, now is the time to make sure you’re on my newsletter list, because I’ll be sending out free Advanced Reader Copies and giving away swag in the months to come. Don’t miss out!